Almost two years ago our lives were forever changed by our Father's diagnosis of stage 4 prostate cancer. After meeting with several oncologists we began the process to have our Father's care and treatment done at MSK. It has been one of the best choices we made. We feel confident in the level of care he recieves and we trust the doctors. MSK has afforded us so many oportunities to extend the amount of time we have with our Father and it has allowed for his increased quality of life. So why do we run for Fred's Team? 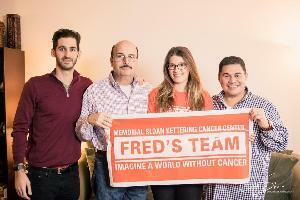 Fred’s team also gives hope through the incredible work that they do to make cancer a thing of the past. Hope that cancer may be a part of your life, but not dictate your life. Every treatment breakthrough or new treatment option represents an opportunity for a cancer patient to live an extra day, week, month, year, or even many years with a sense of normalcy. As we watch my dad’s physical and cognitive ability rise and fall as his body processes each treatment option he goes through; hope, emotion and reality follow in tow. The fact that the work of Fred’s team can lead to one more breakthrough or one more treatment option for someone battling cancer inspires hope, hope for the estimated 174,650 men in America who will be diagnosed with prostate cancer this year. Lastly, Fred’s team represents awareness. I bet that number of 174,650 men being diagnosed with prostate cancer in the US THIS YEAR surprised you. 1 in 9 men will be diagnosed with prostate cancer in their lifetime. It’s a very high number, it’s a very common cancer. 1 in 9 will be diagnosed, 1 in 41 will die from it. Prostate cancer is highly treatable, and even CURABLE if you catch it soon enough. This fact is true for many types of cancer that effects both men and women. The outcomes are dependent on each of us taking control of our health, going to the doctor regularly, and covering our bases so that if we are unfortunate enough to be diagnosed with cancer, or something else, we ensure we are fortunate enough to have caught it early enough to fix the problem. Please use this as an awareness opportunity and schedule your next physical with your doctor. Do this for yourself and your loved ones.